This VIOTEK GN27C2 review begins with a bad first impression, which gradually tranforms into an overall satisfactory experience. 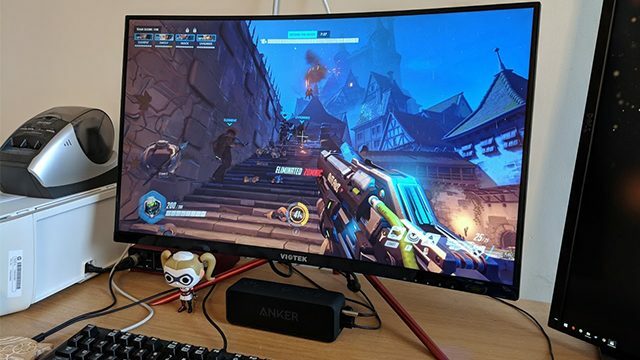 After looking to finally upgrade my partner’s aging LG 1080p 60Hz IPS screen, I began to track down budget monitors that could potentially satisfy her demand for gaming at higher frame-rates. As we come to the end of 2018, where great gaming products are seeing their prices slashed as the holiday hype begins, I’ve become increasingly aware of monitors with premium features starting to become much more affordable. For relatively little money, you can grab a 144hz monitor boasting a superior VA panel. Filter the selection down to 27” and you’ll find VIOTEK’s GN27C2 currently priced at $300*. Let me get the bad initial impressions out of the way with first, before hitting you with everything I like about the VIOTEK GN27C2. When I received the package, the first thing I saw was that “Gaming” had been misspelled, with it instead reading “Gaminig.” While text on the box certainly won’t affect performance, it did sour that initial bit of hype. The next bit of bad I discovered, and it still is one of the weak points about this monitor, is the stand. While it’s incredibly simple to set it up, the stand really doesn’t allow for much adjustment at all. And it’s too wide to actually fit on my monitor risers. We’ll need to replace the stand or resort to a VESA mount for comfort over long periods of use. The final thing that made for a bad first impression was the default color calibration, or lack thereof. Now, I’m not looking for this to be super color accurate, as it’s intended for gaming and users will likely have the in-game gamma cranked up for the competitive edge, but the GN27C2 was noticeably bad in a room filled with three other calibrated screens. It can look good, with wide sRGB coverage, but we had to resort to our trusty calibrator. 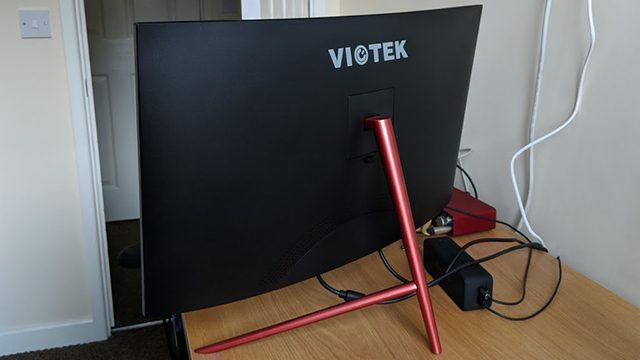 After throwing away the “Gaminig Monitor” box, tilting the stand to provide best possible comfort, and calibrating the screen, the VIOTEK GN27C2 actually started to impress me. While 1080p at 27” may be pushing it for some folks, I really didn’t see any issues with pixel density over regular viewing distances. Up close to the monitor, of course you can see the squares, but this screen is for gaming, not smooching! The 1800R curve is subtle and I’ll admit that I started to like it. While 24” curved monitors can appear a little pointless, at 27” I think it looks pretty nice. My not-so-savvy friends were impressed with the curve and noted that it made the product look more “modern.” I suppose it also means that you don’t have to move your head while checking information at the corner of the screen, so that’s a nice benefit. VIOTEK branding is seen on both the back, in a fairly massive white font, and on the front, again in white. I have no problem with companies wanting to proudly stick their names on products, but a more subtle approach would have been appreciated. Of course, VIOTEK isn’t alone in this crime, but shining a spotlight on the unfamiliar brand lessens the otherwise premium appearance. The VA panel with its 144Hz support is the GN27C2’s most significant feature. Once calibrated, the display looks great with exceptionally dark blacks. I can’t see any backlight bleed and peak brightness is higher than I would ever choose. It’s really solid, overall. I’m so glad we’re (mostly) over the TN craze, as now we’re getting both 144Hz and great visual quality, all for a low price. Without tweaking any settings in the OSD, I did notice some ghosting while playing Overwatch. Cranking up the Overdrive setting to the maximum made this a lot less perceptible. Input lag isn’t an issue with this panel, again making it ideal for gamers. Oh, and the screen has an anti-glare coating, which I find to be a must-have in a room with any windows or bright lights. Bonus points are awarded for FreeSync support, which will help keep things smooth for any users who have a system powered by AMD graphics, be that PC or Xbox One. As for connecting those devices, there are two HDMI inputs and one DisplayPort, shielded by a removable plastic cable management panel. This is an acceptable amount of ports for buyers on a budget. While I’m angry that people can use these to get an unfair edge, the GN27C2 does come with built-in crosshairs, which plops a pointer in the center of the screen so that users can aim more accurately. Again, it’s annoying and cheating in my book, but it’s a feature. More appreciated, by me at least, is the Low Blue Light mode, which helps lessen the strain of cooler tones. Other options accessed through the OSD are pretty basic. Color options could be a little more expansive, but that’s my only real problem. Navigating using the four buttons (five including “Power”) is simple enough, though you shouldn’t have to visit the OSD very often. Just get the colors as good as you can, turn the speakers down to 0 (more on that in a moment! ), and you should be good to go. Though the GN27C2 does indeed have speakers, they really aren’t very good at all. If you’re budgeting for a new setup, please do yourself a favor and factor in an additional audio solution. In a pinch, we quickly grabbed a cheap Anker portable Bluetooth speaker. Unfortunately, monitor speakers are rarely ever worth shouting about, especially when incorporating a really thin body. The trend continues here. *The VIOTEK GN27C2’s $300 price tag has been described as “introductory,” with the actual eventual price being $360. 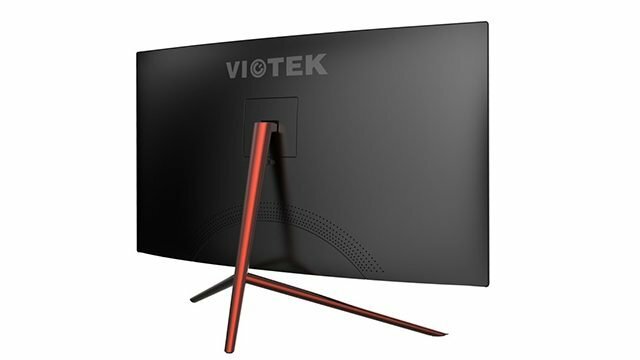 With that said, at time of writing there isn’t currently any stock available on the VIOTEK website, and with competitors lowering prices on similarly specced displays, I’m a little curious as to whether the $300 asking price will ever rise. At $300, the GN27C2 is a compelling choice when looking at budget gaming monitors. 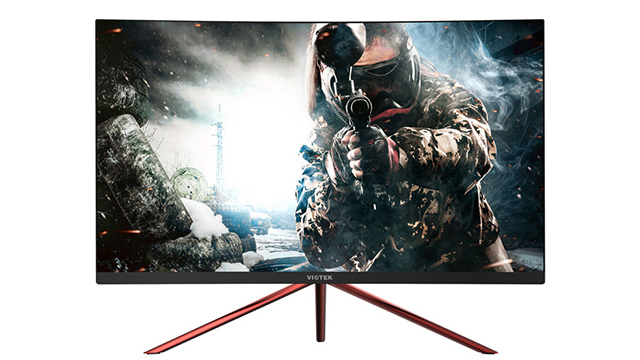 It impressed me with a great-looking screen that is ideal for gamers who want that 1080p 144Hz experience. While the default color settings, poor stand, and speakers leave a lot to be desired, I feel the good outweighs the bad here. 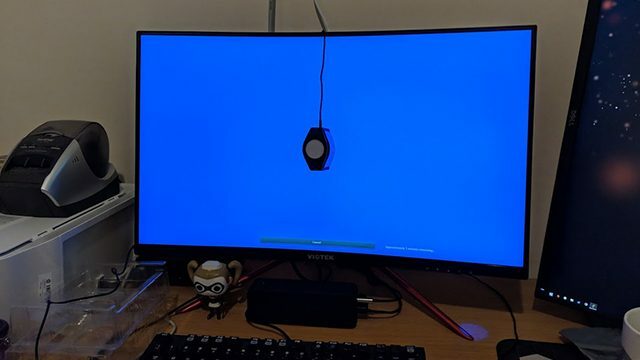 When shopping around for a budget monitor like this, things can get a little confusing, as there is just so much choice. 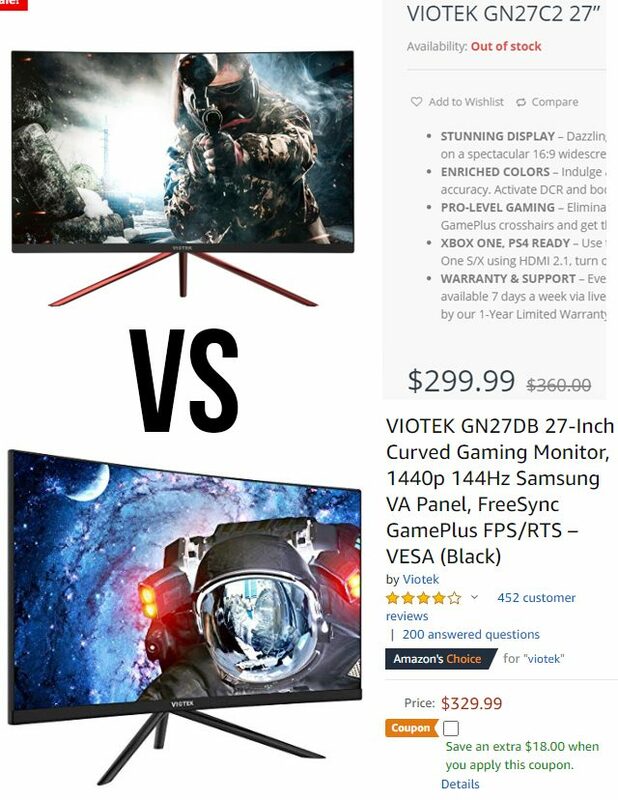 When looking at VIOTEK specifically, I can spy a 27” 1440p 144Hz VA monitor on Amazon for just $330. That’s a significant resolution bump for just $30 more! My advice would be to keep a close eye on pricing and strike when the deal is at its hottest. If the GN27C2 appears to be the best bang for the buck when you’re looking to buy, then I’d say go for it. I have no reservations about recommending this product when its price is lower than the competition. A bit of tweaking within the settings, combined with a replacement stand, will help turn this display into a winner! GN27C2 monitor review unit was provided by VIOTEK.